November is a month marked and remembered by poppies. In Britain, iconic red poppies are distributed by volunteers for the Royal British Legion every year. They are worn as a mark of respect for the fallen service men and women killed in conflict, during the two World Wars, as well as those who have fallen since. Wreathes made of poppies are laid on Armistice Day (November 11th) and a two-minute silence is observed. Poppies were the first flowers to grow in the Northern France and Flanders battlefields, at the end of the First World War. These fragile looking flowers are resilient and hardy – and seeing them grow on an otherwise barren area, was an inspiring sight. Therefore, they became a fitting and poignant reminder of the people we loved and lost, during war. During the 1st – 11th of November, poppies are worn in remembrance, but it’s also worth taking a little time getting to know these colourful plants just a little better – so here’s ten facts to get you started. #1: Poppies are part of Papaveracae family – consisting of approximately 42 genera and 775 known species. #2: The poppy species Papaver somniferum is known as the source of the crude drug opium. #3: Poppies can grow up to 4 feet tall, with the largest flowers being up to six inches across. #4: Most poppy species secrete latex when injured. #5: The oriental poppy Papaver Orientale, has dark blue pollen! #6: Poppy seeds are rich in oil, carbohydrates, calcium and protein. #7: Products such as cooking oil, salad dressing, margarine, paint, varnishes and cosmetics can all contain poppy oil. #8: In Greek and Roman myth poppies flowers were offered to the dead; they’re also often carved on tombstones. This could be because they also symbolise peace, death and eternal sleep. #9: The seeds from poppies contain small amounts of morphine and codeine – but if the seed and oils are harvested 20 days after the flower has opened, morphine is no longer present. #10: Canadian soldier and surgeon John McCrae immortalised the image of poppies in a field, forever linking it as a symbol of remembrance for the fallen, in his poem ‘In Flanders Fields’. 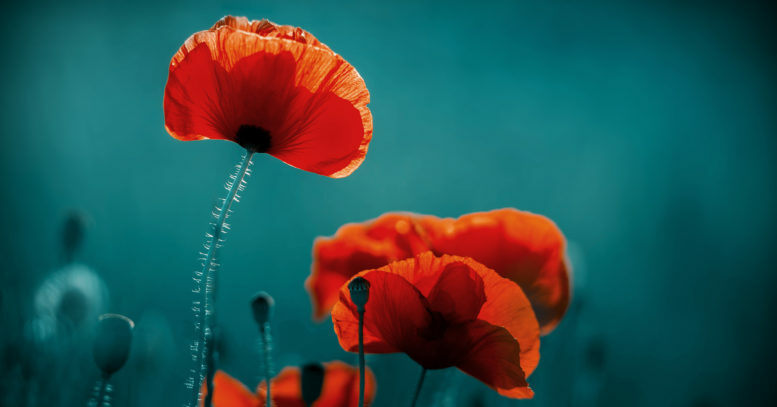 Since ancient times the poppy has been known for its analgesic and narcotic medicinal and recreational use drug – but for many, it will forever be known as the flower of remembrance to those we’ve lost.